For a brand that has risen from ashes, MXR is definitely doing a good job at continuing their legacy. 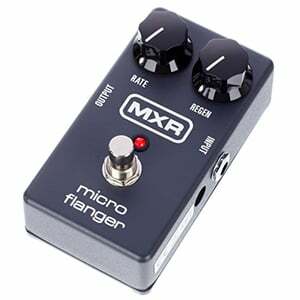 MXR M152 Micro Flanger is easily one of the most capable flangers you can get at the moment. There are many reasons why and today we’re going to check them out. When Dunlop acquired MXR, they had every right to completely disfigure the brand any way they wanted to. Fortunately for us, Dunlop had no such intentions. Instead, they have preserved the spirit and essence of MXR in its true form. That is very much obvious when you look at M152 Micro Flanger. They have used that same MXR design patter that dictates a single color finish with a simple MXR logo. Even the knob caps are the same ones MXR used back in the day. With this brand, simpler is better while function over form is still the standard. The chassis this pedal comes in gives off a bulletproof vibe. Under the hood, you’ll find a fully analog circuitry with bucket bridge included. On top of that, M152 features a true bypass switch. When it comes to build quality, you’re looking at the same bulletproof chassis we love so much. In that classic MXR fashion, M152 comes with a very simple control interface. In fact, there are only two knobs for you to use. One controls rate while the other is labeled as Regen. As underwhelming and downright limiting as this sounds, the two knobs are more than enough to dial in a good tone. The foot switch is great too. While mentioning foot swtiches isn’t something you see too often in reviews like these, we had to mention it. 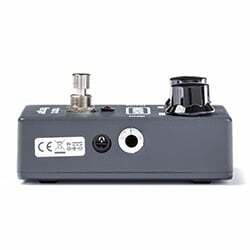 MXR has had a rough period when it comes to foot switches that failed quite often. The stuff they have been using in past few years has solved that issue completely. MXR even went ahead and upgraded to a true bypass switch for M152. Overall, it might take some time to truly master this pedal, but it won’t be long before you figure out how to bring it into submission. The main reason why so many guitar players flock to this flanger is its performance. It can be described as authentic vintage sound with modern flexibility. Ultimately, MXR went for a classic flanger that reintroduces a genuinely analog vibe to the signal chain. On a default setting, MXR M152 gets you fairly close to Eddie Van Halen’s flanger flavor. Messing around with controls can push that performance to a more modern setting if you wish so. What matters the most is that the core of the effect always has that analog aura no matter what. We have seen a whole bunch of awesome digital flangers, but it is still a widely accepted that nothing can truly replace an analog circuit. The inherent simplicity of this design brings another value to the table. Making quick, on the fly adjustments on this pedal is extremely easy. Even in dark conditions. Without trying to sound nostalgic, MXR M152 Micro Flanger brings back the analog goodness of a vintage flanger. It is bulletproof, offers a very consistent performance and simply delivers when you need it the most. Best of all, you can get all of this at a price that’s highly competitive. 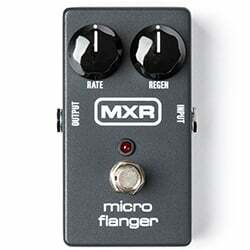 For more info about the MXR M152 Micro Flanger, click here.